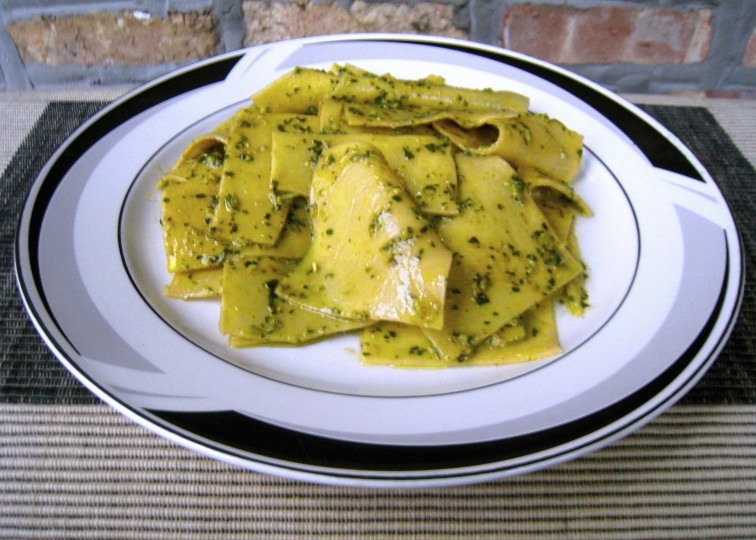 It’s been said that the Inuit have 100 words for “snow.” I’ve no idea whether that’s true but I bet the Italians with their pasta can come close, matching them pasta shape for snow term. You see, as many pasta shapes and sizes that you may find in your local market, they are but a small fraction of the pasta varieties available, particularly if you’re lucky enough to visit Italy. It’s as if every restaurant there features a couple pastas that you’ve never heard of, each of which comes with some story behind it. Fazzoletti, today’s recipe, is one of those pastas. Derived from the Italian word for handkerchiefs, Zia and I were served this pasta for lunch one day in a small restaurant not far from the Coliseum of Rome. 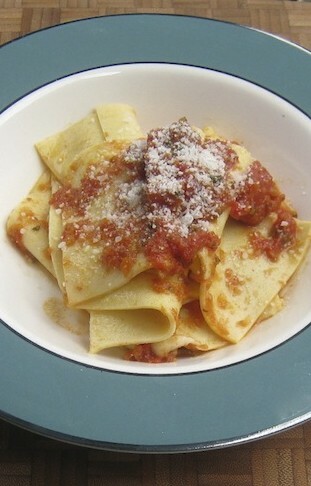 Today, I usually make fazzoletti with the dough scraps left when I’ve made some other pasta. Definitely the easiest of pastas to make, they are simply squares that can be anywhere from 3 to 6 inches long, per side. Personally, I tend to make mine around the 3 inch mark but two or three 6 inch fazzoletti, lightly dressed, make a perfect primo piatto. Whether you serve them large or small, you’ll amaze your dinner companions with your knowledge of Italian cuisine’s more obscure pastas. It works every time. To serve: your favorite tomato sauce (marinara or meat-based) or your favorite pesto (traditional or Trapanese). Be sure the dough has been allowed to rest at least 15 minutes before starting to roll it. Using a knife or dough scraper, separate a ball of dough, roughly the size of a very large egg. With your hands, flatten the dough somewhat, making a square. Set your machine’s rollers to the widest setting and dust the rollers with flour. Place one edge of the dough between the rollers and turn the crank, causing the dough to grow thinner as it passes through the rollers. Lightly flour the dough, fold it in half upon itself, and pass it through the rollers again. Repeat this, without adjusting the rollers, a few times. Once you have rolled a few “eggs”, adjust the rollers to the next setting and pass each dough sheet through the rollers. If the dough is at all sticky, dust the sheets with flour. When all the sheets have been rolled, fold each in half and send through the rollers again. Adjust the rollers and repeat Step 6, again and again, until the strips are the desired thinness. You should no longer need to flour the strips between passes through the rollers. Lay a dough strip on the work surface. Use a pastry cutter to cut the strip into equally sized squares. Remove the fazzoletti and place in a single layer on a floured surface or lined sheet pan. Cook ASAP. Storing dried fazzoletti is problematic and some breakage is all but assured. Fresh fazzoletti will take minutes to cook in a pot of salted boiling water. Once cooked al dente, reserve some of the pasta water and either pour the pot’s contents into a colander or use a “spider” skimmer to remove the pasta from the water. As I’ve mentioned, I normally make fazzoletti out of pasta dough remnants, most often after making a tray of lasagna for friends. I usually have enough pasta dough and sauce left over that I can quickly make myself a nice dinner of fazzoletti. If, heaven forbid, I don’t have any sauce, I can either serve it in bianco or grab some pesto out of the freezer. No matter how it’s dressed, you can be sure that I’ll be enjoying a dish of freshly made fazzoletti that evening while reminiscing about Italy, as will Zia when she reads this recipe. Great idea, will do this the next time I make ravis! Yeah, these really are a cinch to make and doing so means one less machine part/roller to deal with. The pasta is already rolled out and all that needs to be done is to cut it into squares. I doubt that it could get any easier. I’m a pasta junkie! Great photos, looks yummy! I am sooo with you and could eat pasta daily without a complaint. I make my own pastas and fazzoletti is, by far, the easiest to make. Thanks for dropping by and leaving a comment. I made pasta from scratch once, but it didn’t turn out this beautifully. I may have to try it again. Thanks for the inspiration! Do try again. It really does get easier with practice and the results are definitely worth the effort. Thank you for the creative idea! That’s one thing about the Italians, Judy, they never waste a bit of pasta dough. Mom used the leftovers to make either linguine or quadretti. When Zia and I were in Italy, we had a lunch of some irregularly shaped pasta. The waiter explained that it was made from leftover pieces from making the day’s pasta. He had a name for it but neither Zia nor I can remember it. Thank you, Judy, for always being so complimentary. I always look forward to receiving a comment from you. I love the comparison of all the words the Inuit have for snow to the number of different pasta shapes! These are great. I love the shape and the way they’re served. Have not heard of them before, and that’s one of the great reasons to travel — one is exposed to so many new things. Really fun post — thanks so much. Thank you, John, and you’re so right about travel. A favorite thing for me to do in Italy is to find a pasta shop. The variety of shapes and sizes is amazing, many of which I’ve not seen before. And when I’m at a restaurant, if I’m not having a frutti di mare dish, I’ll choose a pasta that I’ve never heard of just to see what it is. With a little luck, the waiter will have a story to tell describing how the pasta came about. Hope you and Zia are having a marvellous time cooking up a storm. Thank you, Meredith. I sometimes think that a few of these pastas came into being because someone didn’t want to waste some dough after making pasta that afternoon. Fazzoletti are a perfect example of this. 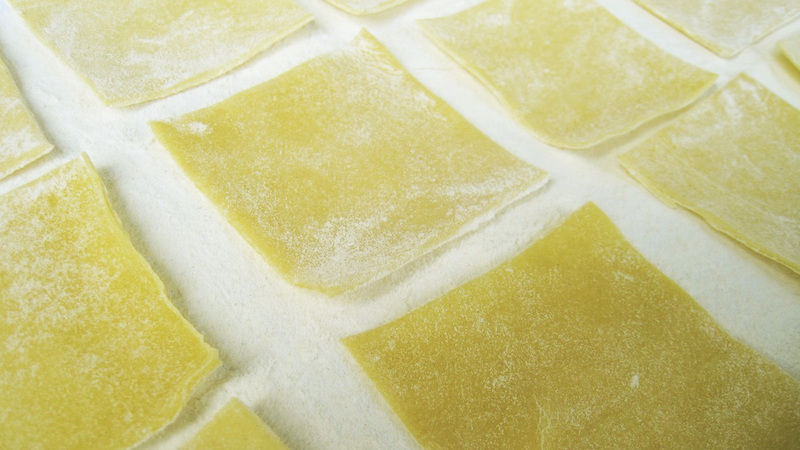 If you roll out pasta for ravioli, for example, and run out of filling, you’re left with pieces of pasta sheet remnants. It is so easy to make squares out of them, though it took an Italian to call them “handkerchiefs”. I don’t know of any hard & fast rules for determining which filling to use with each pasta. There are some traditional fillings, depending upon the region of Italy, but even they are not set in stone. In my case, I make ravioli because I can make them relatively quickly, as opposed to, say, tortelloni which require quite a bit of manipulation. When I make a filling, I always have an eye towards what kind of sauce I’m going to use. If it’s going to be a tomato sauce, the filling has got to be strongly flavored or the sauce will overpower them. At the other end of the spectrum, if the filling is quite mildly flavored, then a simple “sauce” of melted butter with a bit of grated cheese will let the filling’s flavors shine. Adding an herb or two — sage, thyme, or parsley — can be added to the butter so long as the result is too strong.